The Australian Church of Antioch is an Independent Catholic style Church, registered by the Government of Australia as a fully recognised religion. Although we are of a Liberal Catholic style, we are accepting of mystic and gnostic investigation into the truths of Spiritual life, still retaining all the old traditional and beautiful rituals and with genuine Apostolic Succession of Clergy. As stated previously --- our lines were obtained in 1987 via Church of Antioch U.S.A. at the hands of Archbishop Patriarch Herman Spruit, who passed on his seventeen lines of direct succession, and also bestowed upon us the right to be fully autonomous so that we are self governing and owe no alliegence to anyone but God. At the consecration of Presiding Archbishop Frank Bugge, (pictured left) a further two lines of succession were introduced into the Australian church of Antioch via Archbishop Tim Ryan of the Druidic Christian and Celtic Christian lines. These two lines have an exceedingly strong female lineage. "JUDGE NOT LEST YE BE JUDGED" Mathew 7:1. For the beginnings of The Australian Church of Antioch, we must go back to Antioch in Syria to the year 503BC. It was at this time that some of the followers of Zoroaster who were more enlightened than most, were instructed by Darius, (the Persian ruler at that time), to start the Temple of Antioch, which at that time was part of Syria. This temple was to be a place of learning, you could even call it by modern day standards a University. The wise "Professors" of this temple knew of the coming of the next avatar (Jesus The Christed One), and they accordingly taught those who were interested to prepare for this event. Some of those who showed interest were the men that we now know as the three wise men at Jesus' birth. They also knew a place was necessary to act as a base for the work of God to be propogated on earth, and thus was Antioch constructed. Around this Temple eventually grew the City of Antioch. As the ordinary folk did not realise that there would be a connection between Jesus the Christ and Antioch, the temple was literally left in peace to be there when it was necessary for it to become the birthplace of Christianity. Jesus was quite aware of all this and he visited every one of the places that would start up a church in his name, and quite a few other places as well. This accounts for all those years between his boyhood and the beginning of his ministry. In early 38AD, the Apostles Peter, Paul and Thomas went to Antioch and there they started the first church to be in actual fact a Christian Church. Thomas is credited with starting the Antioch church simply because the heirarchy of the temple would not recognise Peter as a disciple of Jesus because he was first a disciple of John the Baptist before he followed Jesus. Paul, being a student of one of the most famous scholars of the day, was relegated to the status of highly esteemed scholar in preference of disciple of Jesus. This left Thomas who they did recognise as a genuine disciple of Jesus. It was thus that the first Christian Church was created and the line of succession is given as derived from Thomas. In actual fact the trio of Peter, Paul and Thomas performed the first consecration of three Bishops of Antioch. In late 38AD, Joseph of Arimithea, (the uncle of Jesus and one of the 72 further disciples Jesus created) went to Glastenbury in England. Near the site of the future Church he drove his wooden staff into the ground, and according to historians this staff took root and grew into a tree. A cutting from this tree was planted nearby which still stands today. (It is said that to this day the British Queen receives a sprig of this tree every year on the day after Christmas, as she is the perceived head of the Anglican Church). This was the true beginning of the Original Anglican Church from which the Culdees, Irish, and Welsh Celtic churches are derived. It was some years later that Peter, Paul and Thomas went to Rome and started the Roman Church. It is perfectly obvious that Antioch was the first Christian Church, Anglican the second, and the Roman Church last. The Roman Church denies this, claiming to be the original Church, but the Romans ruling the Church came only with the might of the Roman Army to enforce it when the Roman Caesar decided to become Christian. When the Roman emperor Constantine declared Rome to be Christian, it was with the backing of the Roman Army that all were forced into subjection under the Roman Pope and acknowledge him as head of their Churches. The Culdees (a mixture of Joseph of Arimithea's followers and Druids) resisted the Roman successfully by going into hiding and meeting in secret. The Coptic Church of Egypt that was started by the Apostle Mark approx 40-60 AD was also ground down by the Roman Army until they eventually fled into the Egyptian desert and with the passage of time asserted their independence once again. Things changed after the Roman army lost its power, when the Orthodox, and most of the other churches once again asserted their independence, but by this time the Roman Church had instituted many changes, not all being for the better. Some of these changes over time included recommending celibacy, (but not actually forcibly introduced until the 10th century) no women clergy, and many other minor changes. Previously to this time, women were in the clergy, and to be a Priest you HAD to be married. The Anglicans however blundered on until the time of Henry the VIII, and then by Royal decree they were literally ordered to once again become independent. The Australian Church of Antioch has unbroken lineage from all of these sources as well as other lines which mainly emmanate from these origins. The Australian Church of Antioch derives additional lines of succession from Archbishop Spruit and Archbishop Bugge's co-consecrators. These lines include Syrian Jacobite Patriarch of Antioch, The Chaldean Patriarch of Babylon at Baghdad, The Catholic Patriarch of Assyria, The Greek Melkite Patriarch of Antioch, Patriarch of Moscow, Armenian Catholicate-Patriarch of Cilicia, The Metropolitan-Archbishops of Albania, The Coptic Orthodox Patriarch of Alexandria, The Non-Juring Anglican Bishops, Celtic Christian lines, Druidic Christian Kanasi lines, Anglican, Roman Catholic. Pictured below are the Antioch U.S.A. Founding Patriarch +++Herman Adrian Spruit and Matriarch +++Meri Louise Spruit. "The Catholic Church of Antioch is a spiritual community that celebrates the oneness and divinity of all creation. Our mission is to assist in raising the consciousness of all humanity, transform lives, and to assist in the healing of ourselves and the planet through service." Pictured here is Archdruid Tim Ryan ( red robe) co-ordaining a Deacon (Don Priem) in The Australian Church of Antioch. Arch-Druid Ryan in 1987 here in Australia did bestow upon Frank Bugge and Chearle Bugge the lineage of old Celtic Christian and Druid lines. 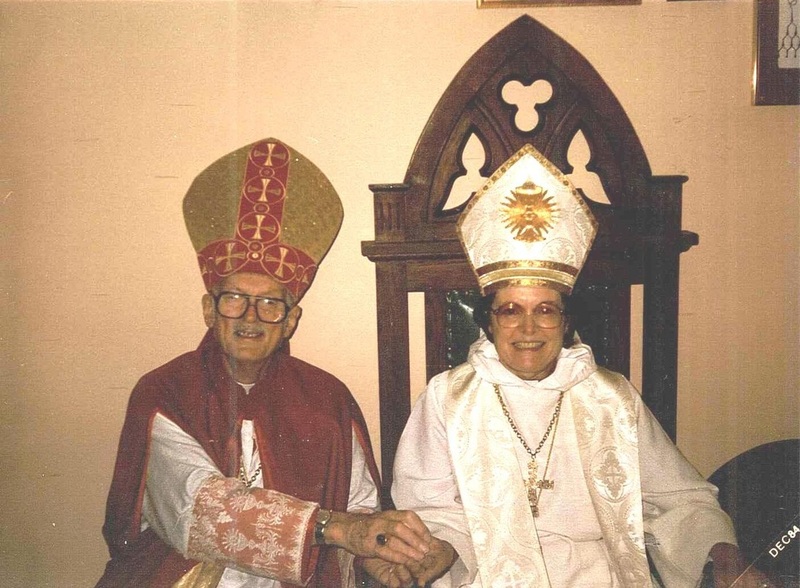 As mentioned above, when Patriarch Herman Adrian Spruit, and Matriarch Meri Louise Spruit visited Australia in 1987, they also had these lines bestowed upon them by the grace of Arch-Druid Ryan. This lineage is mentioned in Leadbeater's book "The Science of the Sacraments" as the source of strong female lines brought into the Christian Church. Leadbeater sought these lines, and knew they would be bestowed upon the Christian Church in Australia. This is the true reason why Leadbeater originally came to Australia, but it was the Spruit's and the Bugge's that finally got them intertwined into the Christian Church lineage via the Church of Antioch USA, and the Australian Church of Antioch. While +++Herman Spruit already had good lines of female succession, this action ensured no sensible valid argument could ever be given against the claim of the authentic strong female line of the Church of Antioch.